Have you ever been faced with what seems to be an “impossible situation?” Jesus was, but He proved He could overcome any apparent obstacle He wanted to. Sure, He is God, but the fact remains that He can do all things He wills. And He can do so in our lives, too! 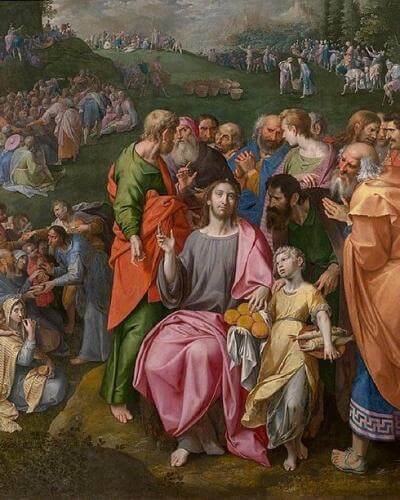 This passage above reveals His confidence in His ability to feed many thousands with only five loaves and two fish. Humanly speaking this is not possible, but divinely speaking, it’s easy. Jesus’ miracle speaks to His commitment to “feed us” in every way. Yes, this was a feeding with food, but it’s symbolic of Him being able and willing to feed our souls with His grace to face whatever hardship or challenge life throws at us. His grace is enough! The problem is often twofold. First, we face some challenge in our lives and we see it as something we do not know how to overcome. This can lead to despair and disillusionment. But when this happens we must reflect upon miracles like this one and realize that all things are possible for God. The second problem we often face is the ability to distinguish between God’s will and our own limited ideas. Too often we come up with our own ideas of what we think is good and right and we start praying for that. But what if God’s idea and will is much different and, of course, much greater?! What if God has a plan that we never could have come up with on our own? The truth is that He does have a far more perfect plan for our lives than we could ever dream up. He knows what is best for us and He can bring that plan to fruition. For our part, we must seek that plan, surrender to it and have faith in His perfect love, mercy, power and love. Reflect, today, on your future. What is it that seems to worry you the most? What is it that seems to fill you with anxiety? God has a perfect plan for that situation. Your job is to seek out that plan and trust it will be brought to fruition. Lord, I know You can do all things and that You will the good in all things. Help me to turn and to surrender to Your perfect divine will. As I surrender to it, help me to have perfect faith that You will bring Your will to fruition. Jesus, I trust in You.